Blackstar Amplification was founded in 2004 by four friends who were also band members. The four did not want just to build another amplifier or pedal effect, but designing a world class, innovative products for the uncompromising guitar player. In 2007, after a little more than two years of intensive technical research, trial and error and a lot of high gain, Blackstar Amplification was officially launched at the Musikmesse in Frankfurt. 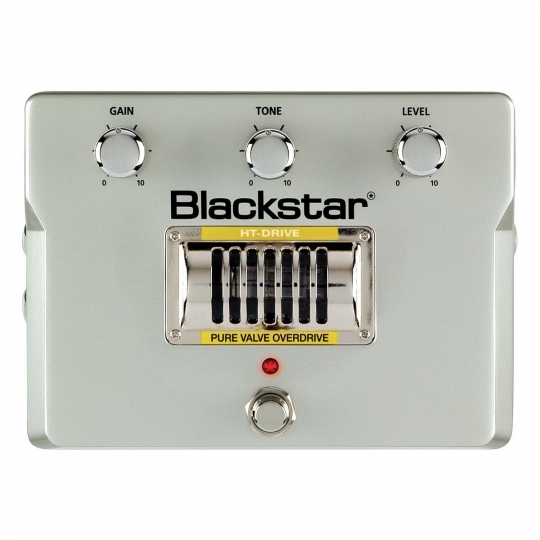 Since then the team grew as great talent from other leading Amplification companies joined Blackstar Amplification, the company produces a large range of amplifier and pedal effects to be used as inspiration rock tools for their emotions. Among the musicians that use Blackstar Amplification products you will find Gus G (Ozzy Osbourne/Firewind), Neal Schon (Journey), Silenoz (Dimmu Borgir) and James Dean Bradfield (Manic Street Preachers) and more great artists. From clean tube boost to a fat tube distortion, the Blackstar HT Drive is a one mean machine. The guitar's best friend is the amp, preferably a tube amp. Cranking the gain stage up and letting the tubes do their work driving your sound. Problem is, tube amps can be sensitive to transportation and usually are pretty heavy. Gladly, Blackstar got us all covered with their HT-Drive.The HT Drive is a valve overdrive, which can be used as a clean boost as well as a screaming valve distortion. It uses a Class A tone control which makes sure your guitar tone stays as natural as it is and in combination with Blackstar's ISF control you can set your tone exactly as you want it to be.One feature on the HT Drive we absolutely love is the Speaker emulated output. What it means is, that you can plug the HT-Drive straight to a PA or your DAW, and enjoy a great tube amp style sound without actually carrying your amp around.